Darlings, to the left you will find Badgley Mischka’s blissful Banner Peep-Toe Satin Pump in Black; to the right you will find rsvp’s ravishing Rae in Black. While the rsvp pretties sport synthetic lining, and a slightly higher heel (4”) than that of the Mischka marvels, which feature real leather lining, and a 3.5” heel; for a mere $69.00, as opposed to the $200.00 required to indulge in Banner, they are an enchanting compromise made with the cheap chica in mind – and allow one to scoop up all four saucy shades (Black, Red, Berry, and Blue)! rsvp, of course! they're almost exactly the same!! rsvp here too. What a necessity to any wardrobe - black pumps! Definitely a staple to have. rsvp find! Oh, great find! Such a great find. Love these. So awesome. I love rsvp. I don't think $200 is too bad for a classic pair of black pumps that you can get a lot of use out of, so I would go with the pricier version this time. they're so similar! great find! 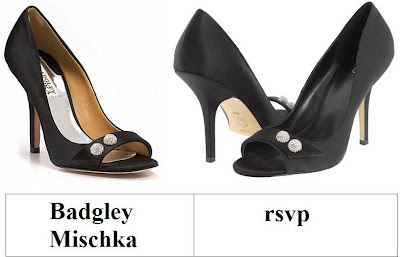 I would go with the Badgley Mischka Peep Toe Pumps. I just love the extra pop of color that they have. Those are timeless! Co classy and chic! I would grab the rsvp ones, they're so identical! these are pretty much exact, so i guess the frugal purchase is the way to go. I'll take the RSVP ones! Badgley Mischka all the way! I love Badgley Mischka. They have the best shoes and bags. Wow! I totally would have thought that Badgely would have been more than $200.... hmmm I'm torn but love the frugal ones as well. They're nice but I'm looking for pumps with different coloured toe caps! These are beautiful! Go rsvp! I like these shoes! Amazing! Oooo, pretty. Love the rsvp ones. Great find, Erika! I'd definitely splurge this time and go for the Badgley Mischka's! love such posts of yours. The shoes from rsvp are a great find! i love these... would look great dressing up a pair of jeans! Wow, they're completely the same! I love RSVP heels and I actually like the black detail inside the heel instead of the silver.